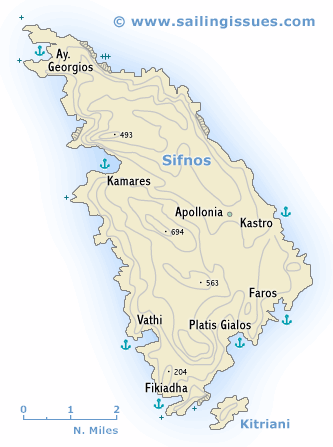 The island of Sifnos - Σίφνος lies approximately in the middle of the triangle formed by Milos, Serifos and Paros. The north and north-west of the island are occupied by barren ranges of hills, the east and south by gentler uplands. The coast is much indented and lined by cliffs for much of its length. Agriculture (particular onion-growing) on the island's fertile soil, the manufacture of pottery of traditional type and weaving bring the inhabitants a modest degree of prosperity. The principal port on Sifnos is Kamares, which is well sheltered, and where you can rent bikes or scooters to reach Apollonia, the island's capital. From there roads leads to the must-see places along the coasts and indeed these also proof beautiful anchorages and should really if possible visited by boat. The medieval village of Kastro - with remnants of its ancient walls - but also the bays of Faros, Vathi and Platis Gialos are absolutely worth exploring: translucent turquoise water, combined with good tavernas. However, the best restaurants (notably To Liotrivi) can be found in Apollonia. Already well populated in the period of the Cycladic culture (3rd and 2nd millennia BCE), the island grew so wealthy in classical times from the produce of its silver mines that the Siphnians built a treasury in the Sanctuary of Apollo at Delphi. When the flooding of the mines made it impossible to work the silver the island declined into insignificance. Entrances to the silver works can be seen near the sea at Ayios Sostis and Ayios Minas. Fortress of Sifnos just east of Apollonia near Kastro. For sailing holidays in Sifnos and the other Cyclades islands, please visit my yacht charter page. More photos and information can be found in this logbook of our trip from Athens to Milos via Sifnos.